Rampion’s Operations and Maintenance base, located at Newhaven Port’s East Quay within the Newhaven Enterprise Zone was officially opened today by Maria Caulfield MP for Lewes. The modern energy efficient facility will be home to the 60-strong operations and maintenance team tasked with the efficient running of the south coast’s first offshore wind farm. Through its construction, the base has already acted as a catalyst for the regeneration of the port and helped to stimulate the local economy. The facility houses the wind farm’s control room, offices and warehousing space and features 48 solar panels, 16 electric charging points, air source heat pumps for hot water and heating and cooling the building as well as other energy efficiency measures. It has achieved an Energy Performance Certificate (EPC) A rating. 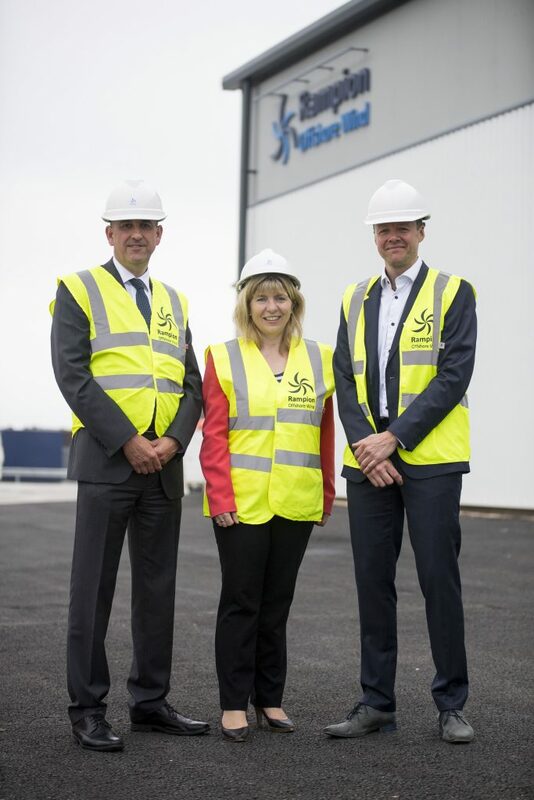 Richard Crowhurst, Plant Manager for the Rampion Offshore Wind Farm, said: “We’re delighted to welcome Maria Caulfield MP to officially open this new energy efficient facility. We’re proud to have been able to support the regeneration of Newhaven Port and look forward to becoming an integrated part of the local community. Last month all 116 turbines began delivering power to the grid, helping to contribute more power to the UK’s growing renewables fleet. The wind farm is due to be completed later this year and will provide enough electricity to supply almost 347,000 homes(1) a year, equivalent to around half the homes in Sussex. The 400MW Rampion Offshore Wind Farm is located 13km off the Sussex coast and is owned by E.ON, Canadian energy infrastructure company Enbridge and a consortium comprising of the Green Investment Group, Macquarie European Infrastructure Fund 5 and the Universities Superannuation Scheme. 1 = Based on an average annual domestic household electricity consumption of 3,938 kWh (BEIS). The building was designed by architects Corstorphine + Wright together with the Hove based engineering firm Helmsley Orrell Partnership (HOP). Newhaven Enterprise Zone is a collaboration between Coast to Capital Local Enterprise Partnership and Lewes District Council. It comprises of eight sites in key positions around the town including the East Quay and aims to improve the economic regeneration of Newhaven over the next 25 years. Rampion’s Project Director Matthew Swanwick (left) and Plant Manager Richard Crowhurst with Maria Caulfield MP at the O&M Base official opening.